Health care reform rally: Yes we can! CLEVELAND HEIGHTS – Repeatedly chanting “Yes, We Can,” some 600 labor, retiree and community activists loudly voiced determination to win health care reform this year at a rally April 17 sponsored by Health Care for America NOW (HCAN). The standing room only crowd filling the sanctuary of Forest Hills Presbyterian Church cheered Sen. Sherrod Brown as he outlined plans for a “public option” in legislation expected to be introduced this week in Congress. 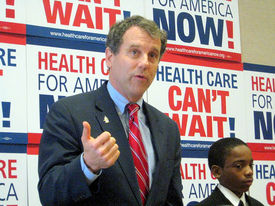 Brown is seen as the lead Senator in the fight in Congress for health care reform. The urgency for basic reform was driven home as speakers gave brief and powerful testimonials of the criminality of a system in which “people must choose between food and pills,” according to Pam Franklin of the Amos Project in Cincinnati. “We must make sure that the care of people means more than the care of profits,” she said to loud applause. The U.S., Brown said, has entered a “new progressive era” similar to the New Deal of the 1930’s and the Great Society of the 1960’s. “The government is on the side of middle class people,” he said, and high on the agenda is an overhaul of the failed health care system. “Medicare, Medicare,” the audience shouted. Brian Rothenberg, executive director of Progress Ohio, said the event was probably the largest of 50 similar actions held around the country during the Easter Congressional recess.